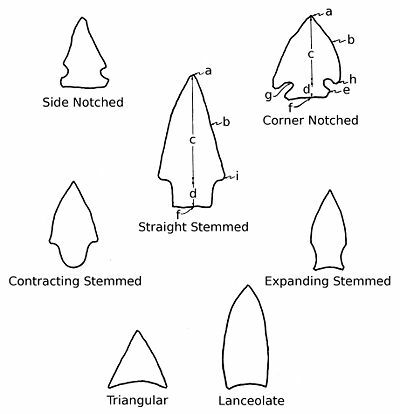 Standard projectile point terminology used in describing Native American projectile points: a - point or tip, b-edge, c- blade or face, d - step, e - tang, f - base, g - notch, h - barb, i - shoulder. In archaeological terms, a projectile point is an object that was hafted to weapon that was capable of being thrown or projected, such as a spear, dart, or arrow, or perhaps used as a knife. They are thus different from weapons presumed to have been kept in the hand, such as axes and maces, and the stone mace or axe-heads often attached to them. Stone tools, including projectile points, can survive for long periods, were often lost or discarded, and are relatively plentiful, especially at archaeological sites, providing useful clues to the human past, including prehistoric trade. A distinctive form of point, identified though lithic analysis of the way it was made, is often a key diagnostic factor in identifying an archaeological industry or culture. Scientific techniques exist to track the specific kinds of rock or minerals that used to make stone tools in various regions back to their original sources. As well as stone, projectile points were also made of worked bone, antler or ivory; all of these are less common in the Americas. In regions where metallurgy emerged, projectile points were eventually made from copper, bronze, or iron, though the change was by no means immediate. In North America, some late prehistoric points were fashioned from copper that was mined in the Lake Superior region and elsewhere. A large variety of prehistoric arrowheads, dart points, and spear points have been discovered. Flint, obsidian, quartz and many other rocks and minerals were commonly used to make points in North America. The oldest projectile points found in North America were long thought to date from about 13,000 years ago, during the Paleo-Indian period, however recent evidence suggests that North American projectile points may date to as old as 15,500 years. Some of the more famous Paleo-Indian types include Clovis, Folsom and Dalton points. Projectile points fall into two general types: dart/spear points, and arrow points. Larger points were used to tip spears and atlatl darts. Arrow points are smaller and lighter than dart points, and were used to tip arrows. The question of how to distinguish an arrow point from a point used on a larger projectile is non-trivial. According to some investigators, the best indication is the width of the hafting area, which is thought to correlate to the width of the shaft. An alternative approach is to distinguish arrow points by their necessarily smaller size (weight, length, thickness). Projectile points come in an amazing variety of shapes and styles, which vary according to chronological periods, cultural identities, and intended functions. Typological studies of projectile points have become more elaborate through the years. For instance, Gregory Perino began his categorical study of projectile point typology in the late 1950s. Collaborating with Robert Bell, he published a set of four volumes defining the known point types of that time. Perino followed this several years later with a three-volume study of "Selected Preforms, Points and Knives of the North American Indians". Another recent set of typological studies of North American projectile points has been produced by Noel Justice. Prehistoric Native American projectile points from York County, Pennsylvania. A collection of stone projectile points from North America. Prehistoric stone arrowhead in situ. Prehistoric stone (Lapa do Lago, Brazil). Little Gasparilla Island beach find. Wikimedia Commons has media related to Projectile points. ^ "Clovis People Weren't First in Americas, Texas Spear Points Suggest". The New York Times. 24 March 2011. Archived from the original on 19 March 2015. Fraser, Ray (2005). "A tribute to Greg Perino (1914-2005)". Central States Archaeological Societies Journal. 52 (3): 144. ISSN 0008-9559. Justice, Noel D (1987). Stone Age Spear and Arrow Points of the Midcontinental and Eastern United States: A Modern Survey and Reference. Bloomington, Indiana: Indiana University Press. Justice, Noel D (2001). Field guide to projectile points of the Midwest. Bloomington, Indiana: Indiana University Press. Justice, Noel D (2002a). Stone Age spear and arrow points of California and the Great Basin. Bloomington, Indiana: Indiana University Press. Justice, Noel D (2002b). Stone Age spear and arrow points of the Southwestern United States. Bloomington, Indiana: Indiana University Press. Oklahoma River Basin Survey Project (1963–1976). General survey report. Norman, Oklahoma: University of Oklahoma Research Institute. Ritchie, William A (1989). A Typology and Nomenclature for New York Projectile Points, New York State Museum Bulletin Number 384. Albany, New York: The University of the State of New York, The State Education Department. Thomas, David Hurst (1981). "How to Classify the Projectile Points from Monitor Valley, Nevada". Journal of California and Great Basin Anthropology. 3: 7–43. Whittaker, John C (1994). Flintknapping: making and understanding stone tools. Austin: University of Texas Press. ISBN 0-292-79083-X. Wyckoff, Don G (1964). The cultural sequence of the Packard Site, Mayes County. Oklahoma. Archaeological Site Report.